Social feeds in premium display advertising become more important as brands and their agencies look for ways to advance media. 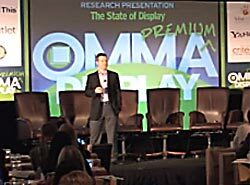 As part of the discussion, panelists at the MediaPost OMMA Premium Display conference in Los Angeles Tuesday talked about the possibility of Facebook offering a banner or takeover ad on its home page. What role do social, real-time bidding, and search contribute to premium display advertising? The panelists agree that agencies and brands must keep the conversation going, but Charlotte Cochrane, director of digital invention at Mindshare, said it's the responsibility of agencies and clients to provide content worth sharing. The paid media buys should complement the earned media, she said. While the term "display advertising" may conjure images of old-time digital advertising, the panel of experts agrees that social and analytics play a major role. It's about real-time optimization, based on data -- especially when pulling in social content and coordinating insights from the community. When it comes to Facebook, Patricia Galea, SVP of digital at Edelman, believes the ads in the feed have more value than those down the right rail. "It's about providing content for members," she said. "It's all about pushing and amplifying content rather than creating a rich-media ad unit." Adam Kasper, EVP at Havas Digital, doesn't view the ads down the right rail as a "premium experience." He's wondering when Facebook will introduce a takeover home page ad that may integrate social feeds. What is premium advertising and how should analytics play a part? For Kasper, gathering analytics starts even before the campaign, but the metrics behind premium advertising is "squishier," he said. That's the challenge. There's always a proxy for premium digital -- rarely a fixed measurement. "That's the flaw with premium advertising," he said. "The programmatic type of buying is measurable and rolls into a return on investment" or measurement that procurement executives or chief financial officers look for in order to quantify investments.